Gear wise, there’s plenty of things a studio engineer needs, and one of those things is a good set of headphones for mixing and mastering. We’ve scrounged the marked and picked some of the finest models you could ever get for the price. Without any further ado, let’s get straight to it. Our opener belongs to a high-end price point category, and it’s widely considered as exceptionally valuable among studio engineers and audiophiles alike. In short, the DT 1990 Pro stands for a professional studio headphone set that boasts a huge level of durability, provides excellent comfort and amazing resolution and imaging. First of all, these headphones are as sturdy as they make them. They band is padded with comfortable leather materials, which feels rather comfortable in combination with the soft, medium-sized cups made of memory foam. The sound signature of these cans is neutral, although the bass is slightly more pronounced than it should be. That’s not too much of a downfall, however, as the soundstage is perfectly balanced, making it absolutely perfect for recording, mixing, and mastering. They also pack an open-back design, which means that there’s plenty of ventilation for added comfort and plenty of headroom and space. Beyerdynamic’s DT 1990 Pro, however, has a few drawbacks that you should be aware of. First of all, these headphones are really expensive. Additionally, the heavy bass can get atop the mids in certain sections, but this can easily be deal with in the mix. The bottom line is that these are high-end headphones that provide a rich, expensive sound. Comfortable to wear even by a long shot, the DT 1990 Pro brings a lot to the table and is definitely worth checking out. Sennheiser’s just one of the leading names in the headphone industry, and here we’re looking at one of their highest achievements in the studio department – the HD 660 S.
Basically, these cans have an open back design which makes them perfect for studio use – on the street, however, not so much. In terms of design, these headphones look phenomenal, but this brand has sort of standardized the aesthetic part of their headphones, so keep this in mind so as not to confuse them with some other model. They put up quite a bit of clamping pressure, but luckily, the ear cups (as well as the headband) were padded with exceptionally plushy foam like material. Additionally, the cups are quite big, so instead of pressuring your ears, they’ll hug them over, in a sense. That being said, it’s safe to deduce that these cans offer quite a lot in terms of comfortability. Durability isn’t lacking too, as Sennheiser’s technologies have time and time again proved to be among the best as far as we’re talking about robustness. Sound wise, HD 660 S offers a balanced soundstage and excellent imaging, which is just one of the reasons why we think they’re among the best headphones for mixing and mastering. Rich and vibrant low end, not overly accentuated mids, and crisp-like highs are to be expected. Sadly, just like our previous model, these headphones do not come exactly cheap. This, however, appears to be the only downfall aside of them being a bit heavier and bulkier than most studio headphones in the price range. Next on the menu is Bose’s QuietComfort 35 from the II Series. The reason why these cans were names as such is because they offer unparalleled sound cancelling abilities. Namely, if you don’t want, you won’t hear anything aside from your music and tracks, which means that they’re specifically tailored for both critical and casual listening. Bose most likely intended these cans for casual use primarily since there’s a microphone onboard, but the reason why they’re so good for mixing and similar studio work is because they come supplied with outstanding drivers and a perfectly well-rounded soundstage. In terms of design, the QuietComfort 35 features a medium sized padded cups and a semi adjustable headband (which is sadly not padded). That means that they’re comfortable, but will put up some fatigue on the wearer after a while. Though not exactly cheap, these headphones aren’t overly expensive either. 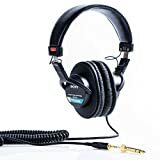 If you’re on a budget and in need of a pair of high quality headphones for mixing, these might just do the trick. 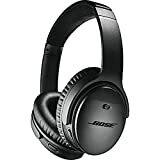 It’s more than obvious that these are ‘studio’ headphones by simply looking at the title – Bose’s Studio 3 are among the finest cans you could find in the medium price point category, as they’re comfortable, sound great, and have excellent noise cancellation technologies. Among the main benefits of these headphones we can state the robust construction, an exceptionally comfortable fit, superb connectivity, an awesome battery lifespan, and outstanding ambient noise reduction. The drawbacks are there as well, though – certain features are reserved for Apple-based applications, such as the connection boost for example. Another bad thing about them is that they don’t have a completely neutral sound signature, since the lower and mid sections are kind of entwined. Regardless, the bottom line is that Studio 3 are absolutely perfect for mastering and mixing, all things considered. Audio Technica’s been on the market for a while, and their ATH-M50x headphones are considered to be some of the best cans for the buck. These headphones come supplied with powerful and accurate 45 mm drivers that deliver incredibly rich and detailed sound, complemented by a reinforced frequency range and massively deep bass. These headphones feature a swivelling circumaural design which is absolutely amazing in terms of comfort and practicality. The cups can swivel up to 90 degrees, making it easier to monitor what’s going on with one ear only. The only bad thing about these headphones is that they’re bulky and heavy, although the plethora of benefits they bring up are more than enough to compensate for such small flaws. It’s true that Sony’s MDR7506 might be one of their cheapest headphone sets, but that’s actually pretty great – you don’t have to pay a fortune for quality if you’re low on cash. These headphones come supplied with an oversized pair of cups which put up a high level of clamping pressure, but they’re thoroughly padded so they’re very comfortable to wear. Isolation is on point too, as the cups envelop the ears through and through. The MDR7506 cans pack 40mm drivers which perform excellent sonically. Another great thing about them is that they’re practically weightless, weighing only 8 ounces in total. As for the drawbacks, the bass here isn’t exemplary, and they’re not exactly durable per se as they’re made of relatively flimsy plastic materials. All things considered, these are budget cans are fairly valuable for the money. Though they do lack some lows, they have everything you could possible need in a studio. The last headphones we’re reviewing come from AKG and are called K240. They’re our most affordable pick, but they’re formidable in every aspect nonetheless. What’s really interesting about these headphones is that they provide a vivid, detailed sound. There’s just about enough bass, and the highs aren’t too bad either considering the price. Imaging is pretty great too due to the semi open design, the same can be said about the soundstage. One of the biggest drawbacks of these headphones is that they offer very little sound isolation. Almost 100% of the sound will be able to come inside, and on higher volume settings audio will bleed out as well. That’s not necessarily a problem in studio environment though. Basically, these are great-sounding headphones that come very cheap, so you should at least give them a shot if you need studio cans and are low on money. We hope you liked our selection of the best headphones for mixing and mastering – there’s something for everyone in our review, as we’ve included models across various price point categories. Kick back, relax, and take your pick.